Say hello to realtime adjustments. minimizing waste, and maximizing every dollar. Taking the guesswork out of field scouting, one flight at a time. Getting the latest data has never been easier. Compatible with SST, Apex, John Deere Operations Center, SMS, Farm Works, and more. 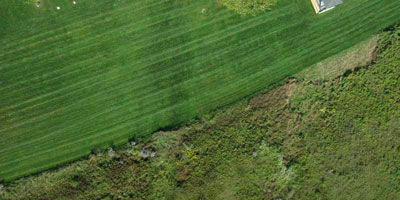 When you call us, we can typically survey your field next day, sometimes even same-day if we're in the area. We'll need the latitude and longitude of your field, and rough acreage. We can survey up to 1,000 acres per day, and once the survey is finished, we'll send you a link to download your Quicktiles in GeoTIFF and shapefile format. Our NDVI and colour Quicktiles provide a fast, easy-to-read assessment of any crop, and can be used with your existing farm management software for realtime prescription mapping. They come standard with all NDVI surveying. and we'll get back to you within 24hrs. 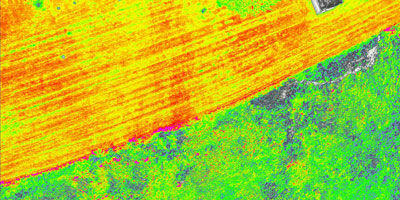 NDVI stands for Normalized Difference Vegetation Index. 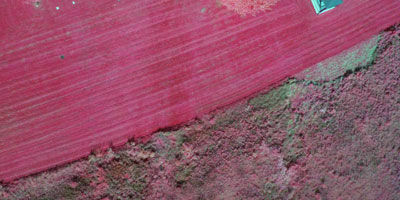 It compares levels of visible (RGB) light with the invisible near-infrared (NIR) spectrum. 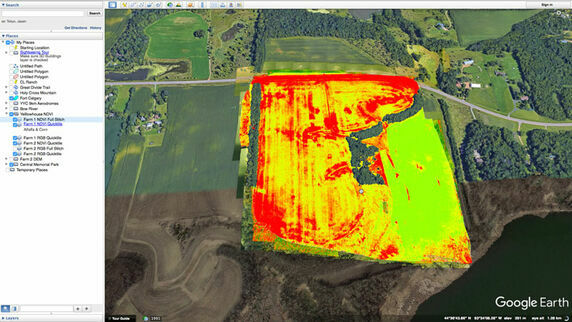 Specialized cameras on our UAVs / drones collect both types of images and the data is processed into an easy-to-read red-yellow-green NDVI map as seen below. Healthy plants reflect most incoming infrared light, while stressed plants reflect less. Non-plant objects absorb incoming infrared light, making it easy to differentiate healthy plants from stressed plants and soil. Applying this to an entire crop can provide an accurate, realtime assessment of its health and density. Our services are available on a per-acre basis. Need a farm surveyed three times? Choose our 3-pack. Additional surveys to compare progress over time are now more affordable than ever. Invite a friend to try Yellowhouse. you get 15¢ off your season. Available in Calgary, Lethbridge, Red Deer, Lloydminster, Medicine Hat, North Battleford and surrounding areas. Contact us for a quote today! Check out Harvest 2016 in Delmas, Saskatchewan. Interested in a highlight reel of your farm?